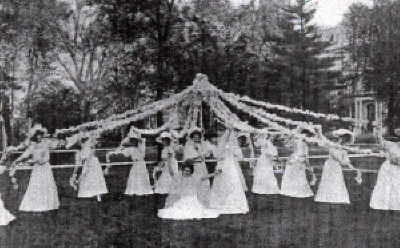 Ancient ceremonies around the Maypole were annual festivals to celebrate the excitement of the coming of spring. Bright flowers springing from the earth would be more exciting if you lived in primitive dwellings as people did over two thousand years ago. Today when a trip to the supermarket yields fresh blossoms any day of the year, there is not as much incentive to gladden our hearts over spring. According to the Encyclopedia Britannica, 1945, the earliest picture of the maypole was found in a drawing in a window in Betley Hall in Straffordshire built by King Edward IV. Size of the window or where Betley Hall is in Staffordshire county the article does not specify. Maybe the building no longer exists although many 600 year old buildings are still standing. The drawing of the entire window is shown below. We are beholden to the artist at any rate because maypoles were not considered worthy of woodcuts or other methods of printing. The festival was ridiculed by Roman conquerors as they introduced Christianity.